High Density Storage System With Shuttle car is a kind of advanced control mode of warehouse accessing, it is of the multi-functions of big storage density, convenient in-put & out-put, high picking up efficiency, and it has more material categories control capabilities than traditional drive-in rack, both functions of FIFO & FILO can be achieved. The system consists of exclusive rack & intelligent shuttle car, and it also can be integrated into a higher level of automated storage & retrieval system (AS/RS) provided that it cooperates with an automated stacking system. The shuttle car racking system is very convenient to use, firstly the shuttle car is put at the front of the track , of whose section is sloped to facilitate the shuttle car mounting by forklift, and then putting goods at the original place of the track, meanwhile pressing automatic in-put key of the remoter to finish the storage process of the pallet goods to be delivered into the deep place of the aisle. When goods to be picked, putting the shuttle car at the original place of the track, pressing automatic out-put key of the remoter, the shuttle car is to deliver the goods to the track end and the forklift is to pick up the goods as the finish of the out-put action, after that turning to next aisle for the same work though. The shuttle car can automatically shift between A-direction and B-direction so that it can fulfill goods-picking at the both ends of the track. 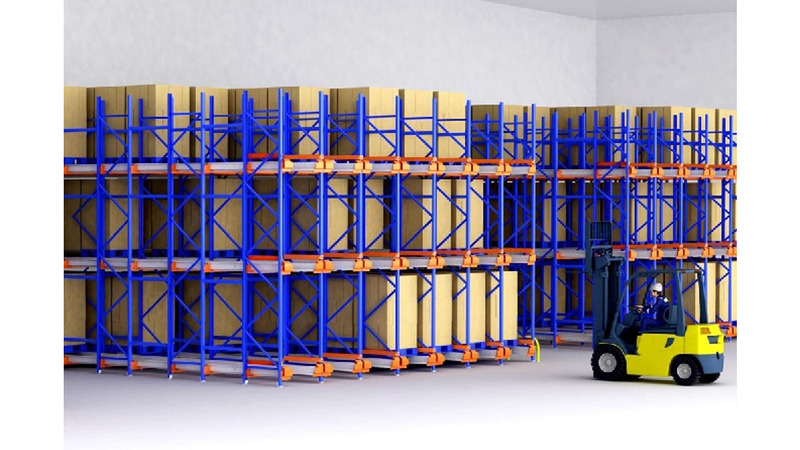 The pallet shuttle racking system is perfect for high-density storage, cold warehouse storage, food production, meat processing, beverage production and distribution, and temporary storage or picked orders.